Du Xue‘s thoughtful and intimate compositions are created with acrylic and watercolour on white silk. Her paintings have a gentle, almost ethereal quality that draws the viewer in. She combines her uninhibited brushstrokes with a spontaneous sense of perspective to create works that have a startlingly fresh immediacy. She paints individual pieces and groups them into a larger composition to create a lyrical and very human visual. Du Xue is a graduate of the Beijing Central Academy of Fine Arts, one of the top tier art academies in China. Her formal training is as an oil painter and she is from the experimental art studio in the oil painting faculty. Her training as an artist started much earlier at the age of twelve when she was enrolled in the attached secondary school of the Central Academy of Fine Arts. Her comfortable mastery of the human form can be seen in the graceful form, pose and ethereal quality of the women in her creations. Her current series is about the subtle aspects and moods of women. Some of the subjects in her paintings appear to be aware that we are able to see them, and they appear shy, demure and composed. When the subject is unaware that we are observing them, they appear relaxed and unrestrained. Du Xue believes in simplification. Facial expressions are often done with faint variations in tone of paint or short simple strokes. Her approach involves reduction of extraneous details, and the magic is in how she leaves room for imagination. Her works often depict the human form from unusual perspectives. Freefall for example, shows her women, light as gossamer, floating headfirst downwards. Her works often feature complex postures that would have been difficult to achieve with traditional painting methods. When we initially saw the works of this artist, we thought she may have used a pin-hole camera or projector to project an image to guide her painting. Watching her paint free-hand is an affirmation of the talent of this young artist. 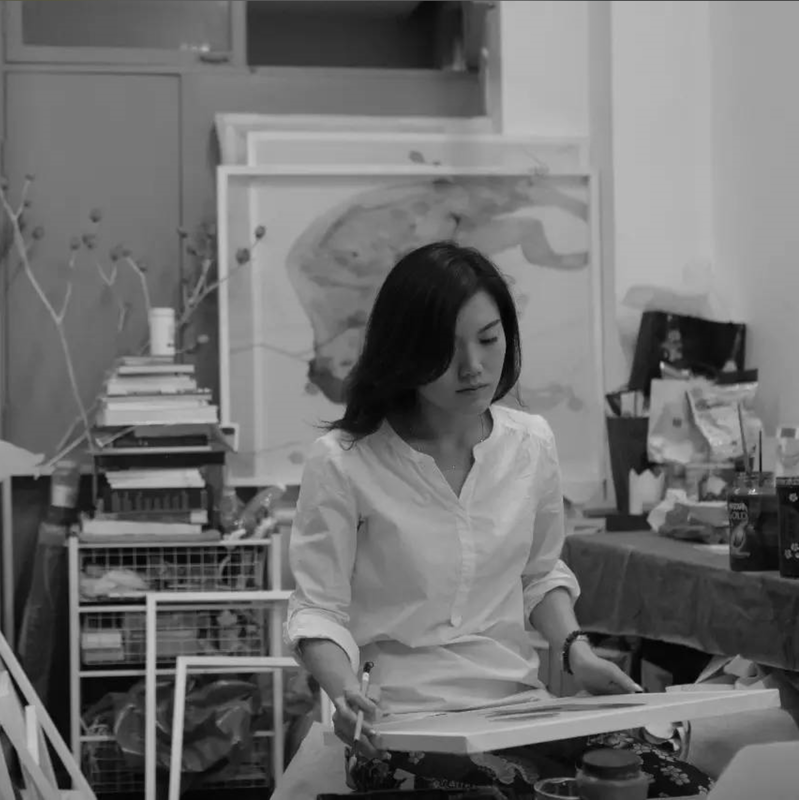 Du Xue’s current series is based on her prize winning work, Empathy. Her delicate paintings of the female form are executed with acrylic and Chinese ink on silk. Silk as a material has a very different absorbency compared to traditional oil painting canvas. Paint, when applied to silk, typically spreads much faster as well as chromatographically. Du Xue uses different types of silk – including imported Japanese silk, faux Japanese silk made in China and Chinese silk. The three types of silk have different texture and absorbency and the choice of silk allows her to create different compositions and effects. After a year of experimentation, Du Xue developed a technique of utilizing acrylic for fine brushwork and outline. She makes use of diluted acrylic and Chinese ink together with the characteristic absorbency of silk to create a wash effect. Her technique is a remarkably unique fusion of western painting and Chinese style ink wash. The effect is all the more amazing considering that she achieves the painted effect by a controlled spread of the ink. “I am never fully in control – the ink often has a life of its own and sometimes defies my attempts to shape the outcome. I am only satisfied with one in three works that I complete.” She often achieves unexpected results – the spread of the pigment creates unusual shapes and forms that she adapts to create human forms from unusual perspectives.